Got lucky with the clear weather over the alps yesterday. Had a good view of the mountains on my flight to Melbourne and there is a very good cover of snow with many peaks and ranges plastered. Lots of comments from *clueless passengers on the plane marvelling at all the snow. *clueless about weather and the fact that a good snow season is being had this year. BOM now saying snow to 600 metres on Sunday morning for the Central Tablelands. That's Bathurst level. Another solid nor'easter here this afternoon. Bom going for 26c tomorrow before the change then a couple coolish days before it quickly warms up again. Looking forward to that splendid snowfall on the 12th, I is! Are the charts starting to hint at the first real change in patterns which will bring about some much needed rain? Both EC & GFS extended show a decent easterly dip and ECL forming. A little windy, but loving this 24° atm. Beautiful day today and still a mild night. The warmest place in the State seems to have been Albion Park at 26.9. The only place outside Sydney or the Illawarra to reach 26 was Walgett on the NW Slopes. Some interesting diurnal ranges in the usual cold hollows. Camden on Sydney's SW outskirts ranged from -0.3 to 26.7, exactly 27. In the old money, 31.5 to 80.0. The cool change seems to have passed through Kiama at 7:43PM and Mount Boyce shortly thereafter. EDIT: and still no rain in the next week. GFS hints at a possible change to the current pattern, as Kino pointed out earlier, in its second week. Morning all...just reporting a light fall of snow here in Orange earlier this morning. Settled lightly on the lawns in my part of town...still some snow left on the ground now but melting by the minute. Looks a bit dark again to the South West..maybe a few more light flakes on the way. This was the third settled fall for the year here ...but all have been very light ! Just when I thought it was all over ...it's snowing quite heavily now with larger flakes. The flakes must "dry and cold" as they are sticking straight away to the ground and not keen to melt. A light fresh cover has now formed in the last few minutes. Just a few flakes here in Lithgow now. It started around 6 am. It's a snowfall. Another one this winter. I know they haven't been great, but at least they are still coming. This weekend has been a little surreal. Yesterday was a mid 20's day. It was extraordinarily pleasant...… and warm and windy. Today I awoke to cold. And blue skies. It quickly clouded over and some brief showers crossed the Sydney basin but nothing was recorded in any AWS. It's been a blustery wintery day. Cold winds and clear blue skies. Temps around the mid teens or just above, but with chill factor temps much lower. Tonight is cold as the wind has abated. 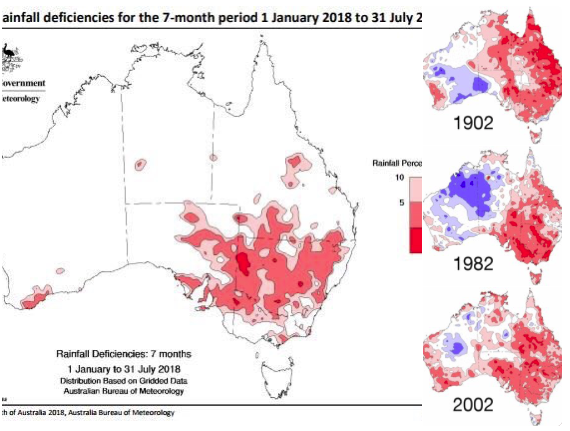 Spending the weekend in Sydney and surveying parched gardens, moisture stressed trees, I wondered how the current dry compared to earlier non-El Nino years. In 1880 Sydney's OH had recorded only 448mm of rain by the end of August with relief finally coming in September. 2014 was very dry to the end of July, but August was very wet. This year is worse than 2014, but not as bad as 1880. Perhaps though it is the worst due to persistently above normal temperatures. Still no rain of significance out to month end by the latest models. Back home, I hear there was little more than a dusting of snow on Sunday morning. Not much rain either - less than 10mm. We need a bit of a reality check - what's happening is terrible, bit it is far from record breaking or historic. While I agree that similar events have happened in the past in terms of rainfall, remember that is only part of the cause of the dry conditions. The other contributor is well above avg temps. To make a proper comparison you would need to factor that in as well to account for evaporation. Also, I imagine the amount of cleared land in 1902 would be nothing compared to now. More natural vegetation would act as a buffer to drought by keeping soil moisture levels higher. Lack of rainfall isn’t the only thing that makes dry periods problematic if temps are high and land has been degraded through clearing and agriculture. Generated in 0.640 seconds in which 0.626 seconds were spent on a total of 14 queries. Zlib compression disabled.